Review Summary: On the whole DHAAI AKSHAR PREM KE lacks a cohesive script and hit music to compliment this love story. 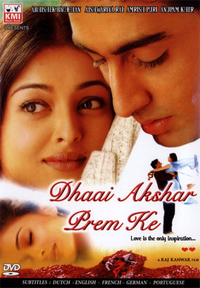 On the whole DHAAI AKSHAR PREM KE lacks a cohesive script and hit music to compliment this love story. WHAT happens when Ms Plastic meets Mr. Wood? That's all I can do: mention it. That's it. It has more entertainment than these two and a half alphabets.